A guide to the SWTOR Level 55 endgame gearing process with a detailed look at every commendation system and all the dallies and weeklies. Updated for patch 2.4. How do I gear up at 55? Abbreviations used in this guide. This section attempts to answer this question in a very basic format. For more info regarding the various gear tiers, you have to consult the sections below. Do hardmode L55 flashpoints, dallies, etc to get your Basic Commendations so you can purchase Black Market gear from the Basic vendor for commendations. If you need set bonus, plan on pugging some storymode operations to get the Arkanian gear. You can either save up 350 Elite Commendations for a mainhand from CZ-198 reputation vendor or save up some credits to buy a 31 barrel/hilt from a crafter. That is the best barrel/hilt you can get without doing any operations. Getting this tier of gear can be donable with just pugging but you have to get lucky with a good PuG as the Underworld/Verpine stuff only drops off Tier 1 hardmode Operations (TFB/S&V/Golden Fury) or from the last two bosses of the Tier 2 storymode operations (DF/DP). From this point on, you will need to really get into a guild to get better drops. Always augment your gear if possible. You don’t have to use the purple augments (28) right away but can use blue augments for now as the stats difference is fairly minimal. For augments search for Augment 28 on the GTN or make them youself). Each Augment also need a MK-9 Augment Kit (search for MK-9 kit on the GTN or make them yourself). New 50s will no longer receive a free set of Tionese gear or any sort of free gear handout. Instead, they must gear themselves with a combination of planetary commendations and classic commendations. You can use your planetary commendations to purchase rating 58 amoring, mods, and enhancements at the Makeb Commendation vendor on the fleet or in Makeb. These are pretty much Rakata level mods. Armoring/Barrel/Hilts cost 10 Planetary Commendations while mods and enhancements cost 4 Planetary Commendations. You have a storage cap of 100 planetary commendations but no weekly cap. If you need a bit more gear, you can do some dallies in Ilum, Belsavis, Black Hole, Section X for classic commendations. Those looking for grouping action can also queue up for L50 hardmode flashpoints or L50 operations to get Black Hole and Hazmat gear (rating 61 and 63 respectively). L50 Hardmode flashpoints have a chance to drop a Black Hole piece each boss. Storymode Karagga’s Palace and Eternity Vault drop 2 random Black Hole pieces per boss. Hardmode Karagga’s Palace/Eternity Vault and storymode Explosive conflict drops 2 random Hazmat pieces per boss. Hard and Nightmare Explosive Conflict drops Dread Guard tokens in addition to Hazmat. Classic Commendations are used to purchase Campaign gear at the Classic Gear vendor on the fleet. These Campaign gear do have set bonus but they do not stack with the set bonus on the L55 gear. Solo dallies in Ilum, Belsavis, Black Hole, and Section X reward 1 Classic Commendations per daily. Heroic dallies in those locations reward 3 Classic Commendations per daily. L50 Hardmode flashpoint bosses drop 2 Classic Commendations per boss and you get 10 Classic Commendations for doing [DAILY] Galactic Conflicts. 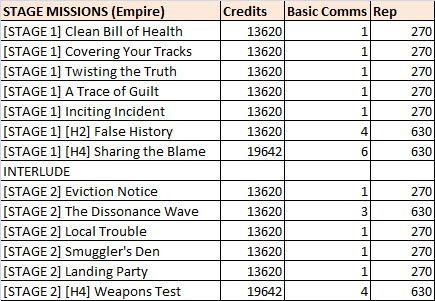 L50 storymode operation bosses drop 3 Classic Commendations per boss and you get 20 Classic Commendations for finishing KP/EV weekly and 40 Classic Commendations for finishing EC weekly. L50 players can also get the Group Finder daily for L50 HM flashpoints which rewards 10 Classic Commendations per day or the Group Finder weekly for KP/EV/EC that rewards 25 Classic Commendations per operation. These rewards are for L50 players only and changes to Basic Commendations as soon as you reach L51 or above. Weekly Priority Targets (kill 3 world bosses) also rewards 12 Classic Commendations. New in Patch 2.4, players who complete the Oricon storyline (level 55) can expect getting a full set of the Artifact quality armor, which are rating 156 with 66 mods. Artifact quality Bracers/Belts/Offhand/Implants/Ear can also be crafted by crafters who can purchase the relevant recipes at the Basic Commendation Schematic vendor on the fleet (Crew Skills section). These recipes requires Hero standing with the Makeb faction and costs 60 Basic Commendations each except for the Belt/Bracers which costs 15 Basic Commendations each. The resulting product is BoE and can be find on the GTN (search for Artifact). Mainhand weapons can be purchased from the Makeb reputation vendors for 80 Basic Commendations each. They also require Hero standing with the reputation vendors to use (takes two weeks to gain the reputation if you are just starting out). Rating: Rating 162 with 69 mods (Q30). Black Market and Arkanian are L55 gear and they are rating 162 with 69 mods (Q30). The difference between them is like the difference between Black Hole and Campaign in previous tiers. Black Market gear have no set bonus and can be obtained from hardmode L55 flashpoints or purchased with Basic Commendations while Arkanian gear have set bonus and is obtained exclusively from storymode L55 operations (ear/implant can also drop from last boss of Hardmode Czerka Core Meltdown Flashpoint). In addition to the set bonus, they have slightly different stat allocations. L55 HM flashpoints can be easily completed by players in Dread Guard/Hazmat gear. Players in Black Hole/Campaign gear or less may consider getting a few pieces of the Basic Commendation gear if they want to play it safe. The four L55 hardmode flashpoints have two bosses inside them that drops Black Market items. The bonus boss (usually require you to kill 80-85 mobs in the flashpoint to unlock) drops a random Black Market item while the final boss drops a fixed set of items. The exception is the Czerka Core Meltdown Flashpoint which doesn’t have a bonus boss but drops Arkanian Ear or Implant. Since these Black Market pieces contain no set bonus, it is advised to rip out the mods and enhancement. Basic Commendations can be used to purchase Black Market gear the the Basic Vendors on the fleet, Makeb Orbital Station or Gravity Hook Seven/Avesta Plantation, and various level 55 daily areas (CZ-198, Oricon) starting at Level 55. The gear you purchase with Basic Commendations do not come with any set bonuses. They are rating 162 with 69 mods. Q30 mods from Arkanian/Black Market gear can be crafted by crafters. Schematics will need to be learned by REing the existing mods on Arkanian/Black Market gear. Keep in mind that the set bonus on your Arkanian gear does not stack with your old set bonus from L50 gear. Tier 1 L55 storymode operations can be easily completed by players in Dread Guard/Hazmat gear. Players in Black Hole/Campaign gear or less may consider getting a few pieces of the Black Market gear. All bosses have a chance to drop one or two Black Market pieces. There is no pattern and is purely random what they drop. The first two bosses of storymode TFB and the first three bosses of storymode S&V will drop only Black Market pieces. The bosses after them will start dropping Arkanian tokens. Note that Golden Fury, an operation boss in Makeb, is a bit of wildcard and may have a chance to drop any of the Arkanian pieces on storymode. You should have full Artifact gear or better to attempt Tier 2 Level 55 operations on storymode. Getting some pieces of Black Market gear will improve your chances as well. The first boss of both operations drop one of two possible loot tokens so you may not always get what you want on the first run. Also, the last two bosses of Dread Fortress and Dread Palace storymode operations drops a random Underworld Token and random Verpine piece instead of the usual random Black Market piece. 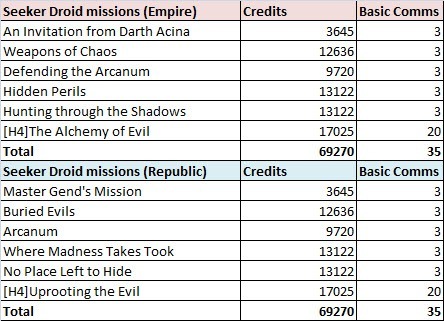 You receive Basic Commendations from one time Makeb story missions, one time Macrobinocular/Seeker Droid missions one time Oricon story missions, and repeatables. 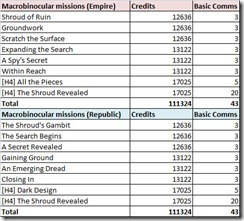 Repeatables includes Makeb, GSI, Section X, CZ-198, Oricon dallies; Group Finder daily for L50 hardmode flashpoints and L50 storymode operations; heroic Space Mission dallies; weekly quests and staged weeklies. Storage cap for Basic Commendations is 1000, with a 500 weekly limit. 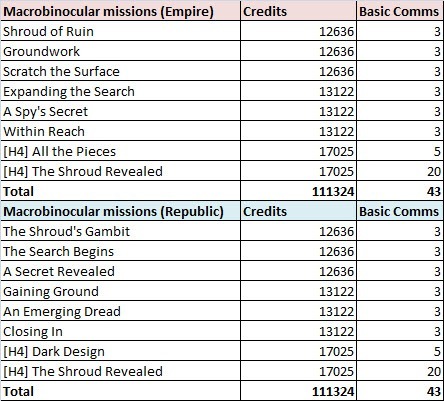 Doing the entire questline for Seeker Droid offers 35 Basic Commendations while the entire questline for Macrobinoculars offer 43 Basic Commendations for a total of 78 Basic Commendations. Requires you to have done Section X weekly, Black Hole weekly and Makeb Staged Weekly once. *Except Sunday where you get 6. *You have a choice for Makeb Stage weekly missions and heroic ones tend to reward more Basic Commendations. You get a minimum of 6 or a maximum of 19 for doing 6 missions required for the staged weekly. A maximum of 104 Basic Commendations per day or 728 Basic Commendations per week if you do dallies for all 7 days. A maximum of 117-130 Basic Commendations from the weeklies at L55. Remember that there is a weekly cap of 500 and a total storage cap of 1000 for Basic Commendations. Rating: Rating 168 with 72 mods (Q31). Keep in mind that the set bonus on your Underworld gear does not stack with your old set bonus from L50 gear but does stack with the set bonus on your Arkanian gear. These items can be found on the Elite Vendor in the supplies section of the fleet. Mainhand can be purchased from the CZ-198 reputation vendor. *The mainhand you purchase here is only rating 162 (Arkanian) level and requires Champion reputation with CZ-198. Tier 1 Level 55 Hardmode operations (TFB, S&V, Golden Fury) can be attempted by players in full Dread Guard but you may need a few Black Market/Arkanian upgrades to succeed against the enrage timer. Terror from Beyond hardmode is much easier than Scum and Villainy and players are encouraged to do TFB HM first to gear up a bit before attempting S&V. Golden Fury in Toborro’s Courtyard on the other hand is slightly more difficult than most hardmode operation bosses due to tight enrage and low tolerance for mistakes. Note that Golden Fury is a bit of a wildcard and might be able to drop any of the Underworld pieces. Tier 2 hardmode operations (Dread Fortress and Dread Palace) do not drop Underworld Tokens. Instead, they drop Dread Forged Tokens. However, the last two bosses of the storymode version of these operations will drop random Underworld Tokens. Q31 mods from Underworld/Verpine gear can be crafted by crafters. Schematics will need to be learned by REing the existing mods on Underworld/Verpine gear. You receive Elite Commendations from L55 HM Flashpoints bosses, Group Finder/Bonus Boss daily, operation bosses and their associated weeklies. 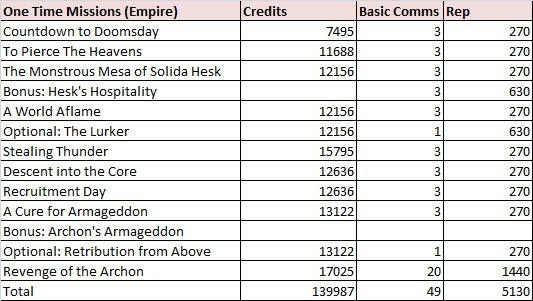 Note that 16m operations drops 2 more Elite Commendations per boss compared to 8m on all difficulties. 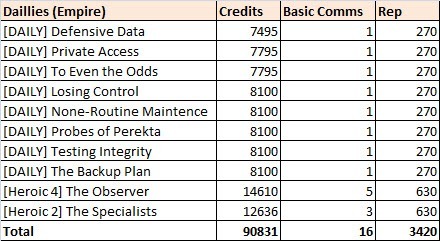 In addition, 16m storymode operations also drop ultimate commendations, which is covered in the section below. Storage cap for Elite Commendations is 400, with a 200 weekly cap. *Every boss other than the bonus boss drops 2 Elite Commendations each. You also get 1 Elite Commendation for finishing the flashpoint. Rating: Rating 174 with 75 mods (Q33). Patch 2.2 introduced Nightmare modes for both Terror from Beyond and Scum and Villainy. In addition to Elite and Ultimate Commendations, these operations drop Kell Dragon token gear and Shadowed gear (Kell Dragon stats without set bonus). These gear are 174 rating with 75 mods (Q33) and cannot be purchased with any commendations or crafted. Kell Dragon gear and Q33/75 mods cannot be crafted. Oriconian gear does not have set bonus and can be obtained as random drops off Tier 2 hardmode operations or purchased with Ultimate Commendations. Dread Forged gear have set bonus and is exclusive to Tier 2 hardmode operations (Dread Fortress and Dread Palace). Tier 2 Hardmode operations requires at least Underworld/Verpine gear to start off. Kell Dragon/Shadowd gear will make things a bit easier. Note that the first boss of each operation and Grob’thok drops one of two possible loot tokens. Ultimate Commendations are only earned as loot drops from hardmode operations bosses, 16m storymode operation bosses, or weeklies. There are also one time reward for completing TFB or S&V the first time that rewards 5 Ultimate Commendations each and one time reward for completing DF or DP the first time that rewards 12 Ultimate Commendations each. Note that 16m operations drop 2 more Ultimate Commendations per boss compared to 8m on hardmode and 16m storymode also drops 4 Ultimate Commendations per boss. With so many dallies and weeklies all all offering half a dozen different commendations it can be a nightmare to keep track of them all. Group Finder L50 operations (3) for players below L55 only. 20 Basic Commendations per operation if you are 51-54.
there is a typo. It’s says “Ultimaye” commendations. Do you get anything for SM FP’s at 50? Can you still queue for these at 55? Just wondering because I still need the HK part in False Emporer and am nearly 55. First post here. Actually, we have done a few Lvl 50 Story-Flashpoints (Ilum & Lost Island), and those Flashpoints now also drop Black Hole Equipment (and classic coms – 1 per boss). I’m not 100% sure about the daily quest for those FPs, but I think you’ll get classic coms. 1) I will have to look up where the crafted gear ranks in this.I also need to make a nice table that says what rating all these various words are. I.e, my brain thinks of 144, 156… as opposed to BH, FG, etc. 2) And then what order should I spend my basic comms for a very low end PvEer? My guess in any MMO is weapon, then tier pieces, then rest? Given that it takes two weeks of rep grind to get the mainhand, I’ve found a lot of people are more willing to just buy a fully (66) saber off the GTN when I put them up for sale. I imagine the same holds true for the armstech crafters. It’s worth noting that Cybertech/Artifice/Armstech can learn item modification recipes from their trainers that, with a bit of reverse engineering, allows them to build rating 156 (Level 66) item mods. Thanks a lot! There were quite many threads about weekly cap, hard to keep track. All [STAGE] missions are weekly? Bonus bosses in the level 55 HM FPs can also drop Black Market gear. Got a Black Market MK-2 Targeter’s Chest last night in Hammer Station. This gear indicated that there was a set bonus for it, though. Are you going to include any more information on the Republic Staged Weekly? Yesterday I got 100/50 planetary comms and Makeb drops them all over, but… what do to with them if you don’t need rakata-level mods? Any shiny toys/speeders/anything to spend them on? You can buy purple boxes are like 36 planetary coms that have a chance to give you a pet and some other stuff. Aha, Thank you, I will do that then. Hey Dulfy: I may have missed it, but if not, doing S&V Story Mode as a 16-man group drops, if I recall correctly, 6 Elite and 4 Ultimate per boss main boss (I don’t remember what loot boss drops). Case in point, 16-man gives dramatically better results than 8-man. But you don’t get the Group Finder reward, since you can’t queue for 16-man with GF? Right, but the Ultimate comms from GF give you 10 per week. TFB has 5 bosses that give 4 each. So it’s still double. Additionally, you’d still get 10 more elite comms. Also, on HM, you get 8 ultimates and 10 elites per boss on 16M, but Operator IX is rough, and TFB doesn’t handle 16 people well (lot of people couldn’t see the adds or even the birthing). Dulfy… you’re my crystal ball of information, please never stop shining. as of now, Tier 61/63 and Tier 69/72 set bonus don’t stack in the sense of 2p+2p = 4p, but they do coexist, at least on Mystic gear, in the form of 2p+ 2p = 2p*2. As much as I like the idea of 6s cd Innervate, do you think it will get fixed or is it an intended feature? Kinda the same question on power-proccing relics stacking their effects if of different Tiers (partisan + conqueror for instance). Working as Intended of B0rked as Expected? I can verify this, Noim. My assassin was using 2 pieces of Arkanian and 2 of.. It was Tio or Rakata, and I was getting a 10% bonus to my shield, not the 5% of a single set – so in that respect, they most definitely do stack. Am I alone in thinking that the optimization of the “Basic” Vanguard BH/Trooper armour is pretty awful for a tank? I seem to be giving up a LOT of Shield and Absorption for Accuracy and Alacrity. I realize Alacrity is a better stat now than it was, but it’s still not better than taking less damage. Are the better tiers of armour the same way? Are there any options for obtaining better mods without doing Operations? Hands down, dulfy.net is the best swtor resource on the net. Dulfy, I just wanted to say thank you for the unbelievable amount of work you do for the SWTOR (and other MMO) community. I play on Harbinger, and have messaged you in game, and you were kind and answered my questions, so unselfish. I not only use, but recommend your site to everyone I know who plays the game. Cheers! You guys may want to consider crafting items, since they have a rating of 156. A cybertech and artifice would give a lot of rating without doing a ton of repetitious dailies. 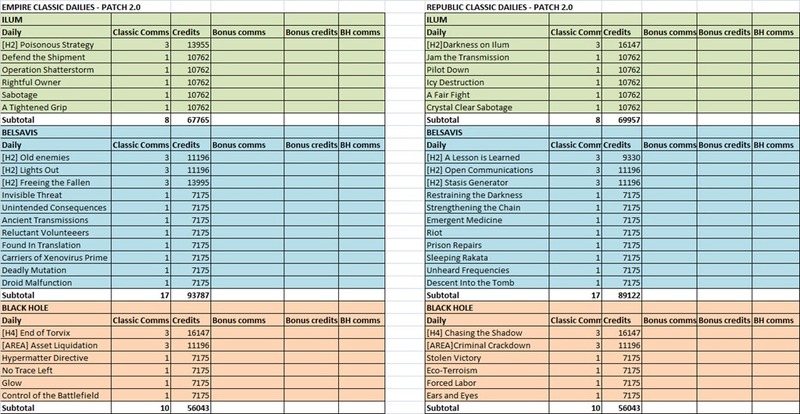 Do you know if SM HP drop any rating 61 mods or classic comm? Do you know of a list of recommended “prefixes” for implants,augments. enhancements, etc? Eventually for my characters but initially for crafting. E.g. I am used to going to web sites like EJ & AMR, seeing what the recommended gems and enchants are for each class and thinking those are reasonable things to start with for crafting, especially for the more popular classes/roles. E.g., my guess from reading DD sorc is avoid prefixes with crit (and ofc command). Is it just there are not many SWTOR theorcrafting sites any more? or the stat ratios still being calculated? Any insight or guidance you could provide would be appreciated! I am working on a list of mods/enhancements/augments etc for min-max,but basically anything with power in them will probably be popular. Dulfy, thanks so much for all your hard work on this site. Now a question for ya. I just made L55 on my Sorc and did it all in Tionese with Makeb mods. It was pretty easy. I have NOT done the Macrobinocular or GSI quests yet. So the question I have is what should I spend my comms on? Or better yet which gear should I be aiming for? Just to let you know I don’t PvP or do any kind of OPS/world bosses. So gear for PvE is what I am looking at. Do you run hardmode flashpoints? I would go for mainhand first for 85 basic comms. If you run HM Fps then you can get alot of Black Market stuff and then use your elite and basic comms to purchase whatever you don’t get from the drops. Classic Comms isn’t really for 55s since you can get much better gear at 55. Thanks Dulfy, thats kinda what I was looking for. As always, your a great source of information. Much appreciated! Okay, I’m totally confused now. Basic Commendation armor sets for Consular are “Pristine Artifact” Battlemind, Exemplar, and Seeker. How do these relate to Force Mystic, Force Master, Survivor and Stalker? I have enough Basic Commendations to purchase some gear, but don’t want to make a mistake and lose the benefit of the set bonus. I’m currently playing a Sage Seer. Shouldn’t matter, none of them have set bonus anyways. Pick the stats you like. I’m not sure of this has been posted but Hammer Station boss I got black market gloves for Juggernaut tank and today during Mandalorian Raiders we got a force-healers chest piece. Hi, what is the best available tier mods you can get going solo ? I remember you could buy tier 61 / 63 off the gtn , can you do the same for the new tier mods ? Dulfy, what do you know about the iLVL75 Kell Dragon and Shadowed set? Are you going to do a guide or something about it soon? Starting with patch 2.2, it will drop from Thrasher. 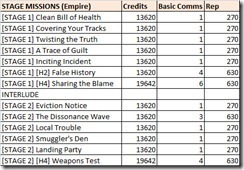 There’s an error in GSI dailies for Basic comms. 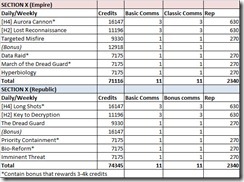 The ammount of comms you can get on Alderaan and Hoth is counted twice because of the subtotals. You can only get 16 basic commendations from those dailies, as opposed to 32. I just want to say thank you for your wonderful guides on this site. I am relatively new to mmos and swtor is the first one I ever stuck around in long enough to get to endgame. Your guides have been a giant help to me through my journey and are continuing to help me now that I am in such unfamiliar territory. So thank you! What secondary stats need to be focused on for different builds? Every bleeping search seems to bring me to this effing page which doesn’t do jack squat for answering a simple question. Where do I need to go to find this information please? 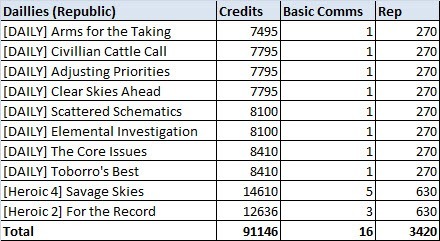 Noxxic has info on stat priority, broken down by skill tree. Don’t use Noxxic for anything, ever. Why should noxxic be avoided? Incorrect info? Poor update speed? Slapped your sister? Ton of necessary information for casual players dropping into game from time to time, and a reminder for all. You are right: it is impossible to keep track of it all just by memory. Thanks for keeping up the info for us! quit after getting your 718 armour and 651 damage lightsabre from basic comms as to get the elite drops you have to do level 55 hard flashpoints which require a group. I’m not whining (well maybe a bit) but it would be good if solo players could grind it out to be able to get elite comms and eventually ultimate gear without having to group even though it would take longer. Yes, they force you to group up to do the group content. And the hardest content is always going to be for groups and at the end of the game. ThAt’s life. I was excited as a solo player to learn I could get black hole tokens from the black hole weekly. I was suspicious of course and went to do the big mission and sure enough….Heroic 4. I really hate how they force players into group play at end game, their should be a heroic 2 option with half the tokens but still doable. a good Operative/Scoundrel or Assassin/Shadow can solo the H4 with a companion… But here is my question for you. Why would you need raiding gear if you only play solo? If you want to continue to Makeb you can simply buy planetary comm gear and easily continue the story. the big mission and sure enough….Heroic 4.
option with half the tokens but still doable. L50 Hardmode flashpoints drop 1 random Level 50 piece per boss. This piece has a good chance to be a Black Hole piece. As always TYVM for great info! Questions: Why do you suggest ripping out mods and enhancements from BM gear? Also, do set bonuses bind to the pieces or the armoring? IIRC, it bound to the armoring at 50. Ahh, right! This does, however, beg the question: What’s better, the armoring stat increase at 55 vs 50 or the 50 set bonuses? I’ll have to look into that. Hey! Great guide, veryuseful. Just a question, what’s up with Black Market Bracers? Where can you get them? There aren’t any to my knowledge, but the Arkanian are very easy to acquire. Hey! 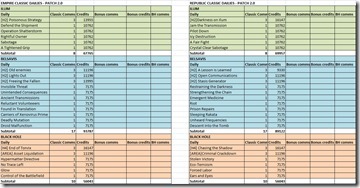 Great guide, very useful, just a question… What’s up with Black Market Bracers? Where do you get them? So I’m confused… Do I do Oricon missions after Makeb. I currently have Black hole headgear, chest piece, armguards, and hazmat boots i think. My gear rating ranges from 126, one or two pieces, to 146ish. I have two campaign relics and lvl 50 earpieces/ implants. I’m I good to do Oricon which will help me get the arkanian gear? Im asking this because i was told to do section x and black hole first, then hm fps, then ops, and then oricon lol. I want to make sure where Im going. I did Czerka Coorporate HM FP and jt was tough. So im kind of stuck on how to get gear since FPS and OPs give a good amount of comms. Im sorry that i wrote a novel but if some one could clarify what i should do i would appreciat it. Remember I only did HM FP Battle of Ilum, False Emperor, Czerka Meltdown, EV HM. These were completed runs but i didnt have much luck in looting. Thanks in advance and yeah i understand Im stupid because Dulfy has everything explained above, i just dont get it. Thank you in advance! Ok by reading more i begin to understand a little bit more about gearing. Let me know if this is how I obtain the gear. And what would be the next step right after I get Arkanian until the very best gear, cause there is NM ops and I dont know where those fit in. Thanks again! Go directly to Oricon, get a full set of artifact gear. Do dallies etc to get basic comms to get some arkanian/black market stuff. Then do some flashpoints/ops (level 55) to get elite comms which give you verpine/underworld stuff. Thank you so much man. The guides that you do are invaluable thank you so much for your efforts and replies! Hey Dulfy! Do u think is better to use rating 180 armorings (whitout bonus) or 162 (arkanian) armoring for a sage healer…. I tested both myself and i didn’t see any difference.. Thank you! I would use 2 arkanian armorings for the 2 pc set bonus but either way works really. Dulfy thank you sooo much.. just came back like a month ago and i’m @ lvl 54. This guide is so helpful; I was already starting to wonder where do i go and what do I do. You’ve set me on the clear path and i can see the light thru the trees. I will strongly recommend your site to everyone who asks for help. Your site has helped me greatly improve my dps and now helped me onto the next stage. Well, im off to finish Makeb so i can start getting my artifact gear from Oricon. Once again ty for all the help and info. Question regarding weekly’s and comms: I am at my ultimate comm cap of 150 prior to accepting the reward for completing the weekly DP quest. If I wait until Tuesday of next week to accept the reward will I still get the comms? Thank you for the response and all the outstanding info you provide here. Question what is better oriconian or dread forged? because i could not get into hm dp or df till i got oroconian and during the ops there are so many ninjas what should i do? hello thanks for the guide. I have many 55 toons and have enjoyed the story mode. I have bought random high end gear for my toons on gtn. what do you recommend for people who just do not like to group as a means to get better gear? It depends on how much better gear. You can get basics easily solo. Elite are a bit harder – I’d recommend Makeb weekly, and maybe the Oricon weekly if you can solo the heroic. The CZ weekly will require you to do the two tactical flashpoints. If you want ultimate level gear, you’ll have to either group or buy from GTN/crafter. No other way around that. The Makeb comm stuff seems good enough to run any of the solo content. The PVP gear is best for world PVP. Do the solo daily stuff for credits, then PVP if you want to for the gear. Otherwise, the gear is unnecessary because you’ll never need it for anything outside of groups, so if you don’t group it won’t matter. The game has some PVP issues though, so unless you enjoy it, it might not be worth going for. End game MMOs are always just gear grinds in groups. Has difficulty of L55 HM FPs been increased? is it better to stack power/surge for sorc heals? Just wanted to express how grateful I am for this guide. It looks like you spent a lot of time and effort creating it. 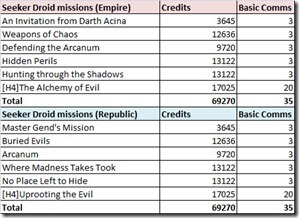 There are very few resources for SWTOR online and this information is valuable, especially to new level 55 players like myself. I ran Dir7 and BoI/FE this Week in Normal Mode and noticed that all Bosses besides the first dropped Black Hole items and Classic Comms. Our group was Lvl 55 if that matters. Can anyone tell me how many credits do you get by doing all the solo dailies???? Anyone knows when a new tier of equipment is coming out? Probably around December-ish, when we are expecting 3.0 to drop. While BW hasn’t stated anything specific, the general expectation is a new level cap of 60, another Makeb-ish planet, some kind of endgame content, and a new tier of gear to go with all that. Of course, that’s speculation, and will happen Soon(TM). Wish this was in english. to much df dp tbs s&v……. Love this guide! Awesome information! I’ve heard about 186 gear. Can you add it to this guide or is it somewhere else? Dulfy, I have a relic question… I have a matrix cube on my scoundrel healer that gives me 112 cunning but it has a rating of 124. Someone told me I need to replace it because of the low rating, but I’ll be losing alot of cunning. What do I do? thanks! Huge help as always! Either Arkanian rating relics as Dulfy said or you might as well PVP a bit to get about 1400 warzone comms and get your Obroan Serendipitous Assault (+625 ish Power 30% chace) and Obroan Focused Retribution (+625 ish Primary Attribute 30% chance) both costs 700 warzone comms and you will only swap them when you get Dread Forged or Dread Master relics. Great idea. I’d like to get my pvp gear sorted as well so might as well go with the relics. Thx for the tips! This guide is complicated or not very clear, can anyone explain in 1-2 paragraphs what a newly level 55 who just finished Makeb should do to gear up for the next expansion please? If you can skip tiers just say so dont need to do the whole progression, just enough for a casual player to be somewhat ready for the next expansion. Once you finish Makeb you should be decently geared. Find the Oricon mission courier on fleet and complete the Oricon storyline. This should provide you with 5 pieces of rating 156 gear. The rest of your gear (implants, earpieces, relics, weapon + offhand, and bracers + belt) will need to be purchased with basic comms. Basic comms are earned in various ways (refer to above). I think the best way to earn basic comms are by completing daily missions on Oricon and The Black Hole. 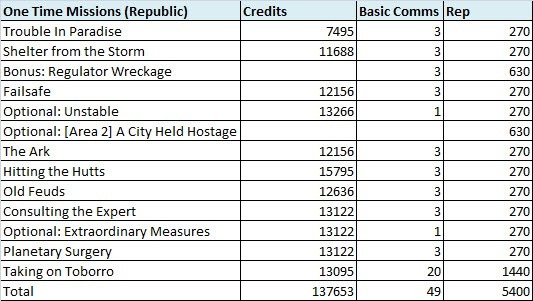 Once you’re pretty much fully geared with rating 162 gear (purchased with basic comms), start earning elite comms (see list above on how to earn them). Level 55 hard mode flashpoints are probably the best way to earn them, just make sure you’re in rating 162 (basic) gear to complete the hard mode flashpoints. Once you’re close to or fully in rating 168 gear (purchased with elite comms), you can easily do storymode operations and maybe even hard mode operations if your gear is augmented, although I don’t suggest getting your elite gear augmented since augments are quite expensive and it isn’t necessary to augment your elite gear. 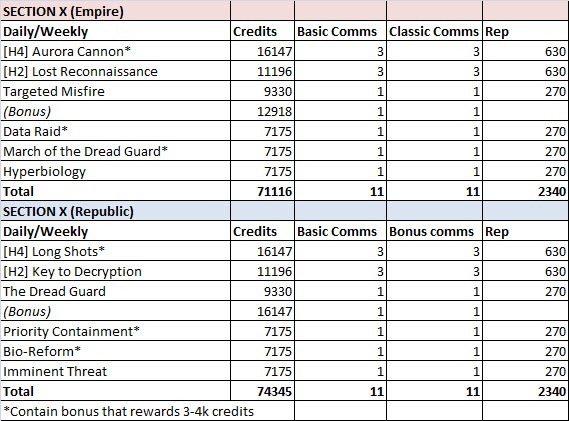 Lastly, once you’re pretty much geared with rating 168 (elite) gear, start earning ultimate comms in various ways (see list above). Augment your rating 180 (ultimate) gear for effectiveness in operations. Once you’re fully geared, you can do hard mode operations and if your gear is also augmented and you are a good player that knows your class well, you can do nightmare mode operations with a good guild. In a recent patch released when you do 8-person story mode operations through group finder, you and your group are bolstered (all of your stats are raised). This eliminates the need for gearing. In addition, you earn ultimate comms on completion of these operations. So you can technically skip everything I said above and just gear up through group-finder operations, though make sure you know the boss fights well. You get 24 comms. You are missing one of the bonuses. Considering the new commendation structuring, will this be updated after 3.0? Thanks for all you do on this site, Dulfy. Agreed. Would like an updated guide for 55-60 if at all possible. Also I hear various things about lvl 60 FP/OP’s that you need specific gear or everyone screams and kicks from party. If you can touch on what gear is minimally required as well as recommended to start lvl 60 FP’s/Op’s that would be equally as nice. I would assume based on this data that 168-180’s would be Ideal to start lvl 60 endgame, without everyone throwing a hissy fit? where can you purchase the dread master gear? There is a token vendor on Oricon (and I believe on the Fleet as well) for Dread Master gear. Is this guide going to be updated for 3.0+ (lvl 60)? Here’s what I’m doing with 12x xp in effect: I was around lvl 52 when I finished my story, I did Makeb quests until I hit 55, then started Shadow of Revan.. you’re given a jesus robot companion that make the solo flashpoints a breeze and reward high-end gear. From there I can get Yavin gear or do HM flashpoints. Hey will you be Bringing this up to date? ?